Bamboo is a giant grass, it’s robust, and it’s also a real heavyweight in terms of sustainability and the latest look. 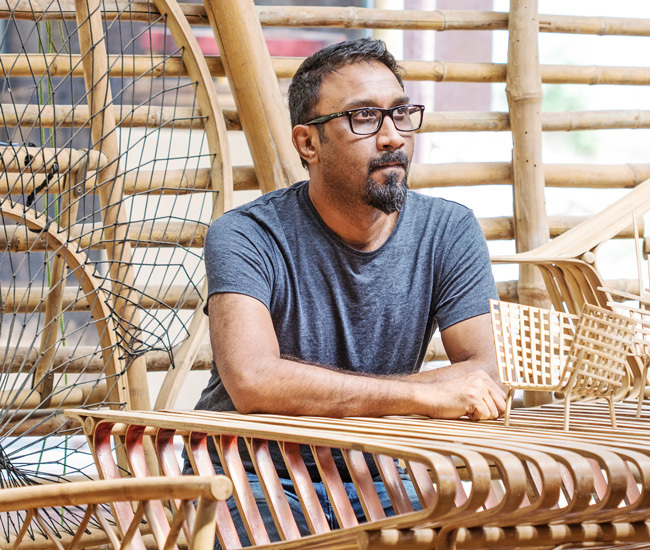 Bamboo may formerly have been known as the poor man’s timber, but furniture designer Sandeep Sangaru has raised the status of this traditional staple and transformed it into a classy envoy for Indian tradition. He advocates this fast-growing material at the 2019 Ambiente partner country oasis, the Starry Night Café. In this interview we get to know a man who’s begun to free up his home country’s traditional techniques so they can be used in completely new ways. Sandeep Sangaru is a time traveller, and he’s into regeneration. He takes techniques based on centuries-old wisdom and makes them attractive to the global marketplace of tomorrow. The 44-year-old uses design as a means of engaging us with ancient crafts. 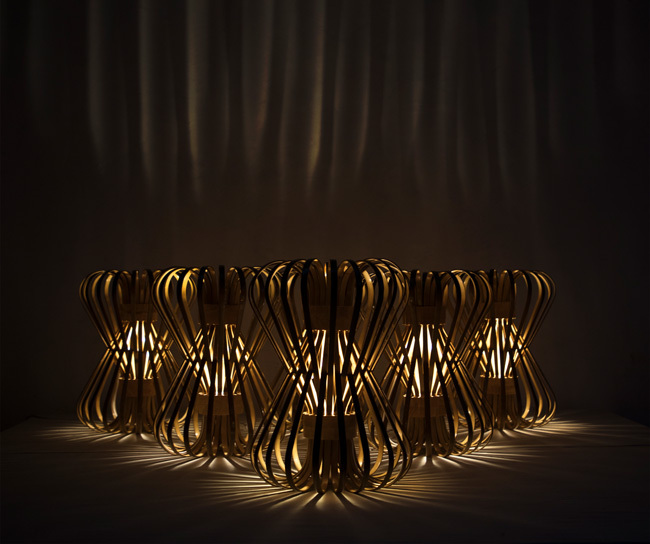 His multi-award-winning studio in Bengaluru, India specialises in furniture design and craft skills. Sanguru was born in Shillong, a town in the mountainous north-east of India known as the Scotland of the East, where he learned to live alongside nature from a young age. “Even as a child, I liked to take things apart and rebuild them, and I never lost that taste for experimentation”, he explains. He studied at the National Institute of Design in Ahmedabad and worked both in mechanical engineering and the Indian film industry, before focusing on this potential, unique to India: the magnificent objects which only home-grown craftspeople can create. Your café uses bamboo furniture under a starry sky. How typical is this of India? The café’s furniture and light fittings were designed in your Bengaluru studio. Bengaluru is known as India’s Silicon Valley, a metropolis more international and cosmopolitan than anywhere else in India. Whereabouts do you work in this buzzing city? Keen-eyed observers can see bamboo growing in giant groves in India – literally see it: in ideal conditions it can grow over 1 m a day. Bamboo is brilliant and is recognised as the raw material for future generations because it is sustainable. Indeed, this tall green grass which many people believe is wood has lively, irregular surfaces which lend even industrially manufactured objects a unique and individual character. Your studio focuses on making objects from bamboo. How did that come about? Your first design was a very unusual chair: it brought bamboo furniture straight into the 21st century. We’ve noticed the striking combination with steel and brass, and some of the bamboo strips are painted in different colours. The overall effect is light, yet sturdy. Furniture designers the world over must also want the same freedom in their designs, but bamboo is not their first choice of material yet. Why is that? 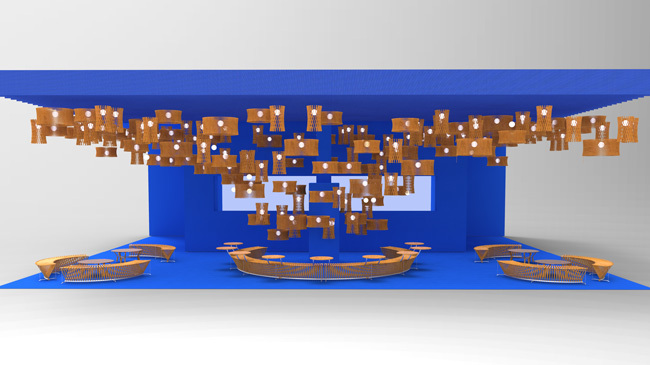 Overall, how would you say Indian furniture design fares on the international stage? Sandeep Sangaru’s new way of working with bamboo supercharged his business. 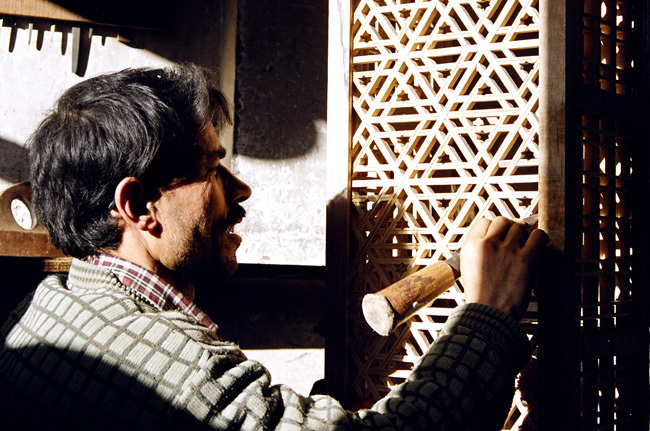 He experimented further; this took him to Kashmir, where with wood carvers he breathed new life into two almost-forgotten Persian craft techniques. Pinjra-kari and Khatamband are traditional carving methods which produce a highly complex geometric pattern from triangles, squares and hexagons. Although this fine decor made of interconnecting strands and gaps in dark walnut wood had previously been used mainly on balconies and ceilings, our designer applied it to chairs. Seen from the outside, these complicated patterns, some of them floral, seem shrouded in mystery. The same could be said of this workers’ community, which gives the impression of being very private. You soon also used terracotta with a traditional lacquering technique. Where did you come across this? Dozens of craftspeople are busy in Sandeep Sangaru’s workshop – not only cutting, bending bamboo and lacquering, but also taking part in the design process. There are specialists from Tripura, woodworkers from Bihar and Kashmir and experienced lacquerware makers from Channapatna, all learning to develop new products: from the ideas on paper to the prototype to the market-ready item. Lots of workshops in India produce sustainably with a social conscience, and work closely with designers. Manufacturing good products requires strong cooperation”. What does your philosophy mean to you? I hear the iconic furniture designer George Katsutoshi Nakashima, who designed famous interiors for public buildings in the USA and was influenced by a deep religious conviction he developed during his stay in ashram in India, is someone you really admire. Are there others? Can you give us any tips on the easiest ways to make a room more beautiful?